You can get a free chapter of the Mad Church Disease at their website. 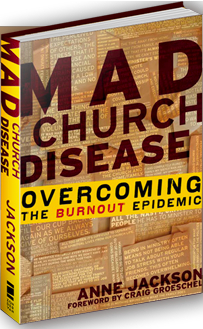 Mad Church Disease is written by Anne Jackson and covers the common problem of burnout in churches with pastors or indeed anyone serving. It is a superb book and currently averages 5/5 at amazon which is a rarity. The free chapter is “Processing through pain” and covers dealing with pain caused by other Christians in the ministry setting. It is a really well structured book, with very honest and personal accounts and a strong biblical outlook.